Nuwara Eliya District, Sri Lanka. The United Nations Human Settlements Programme (UN-Habitat) is conducting several vocational training programmes to enhance capacity and employability of young women and men in Nuwara Eliya district. Funded by the Korea International Cooperation Agency (KOICA) the Human Development Initiative through Empowerment and Settlement Improvement in the Plantation Settlements in Sri Lanka (HDI) Project is implemented by UN-Habitat in close collaboration with the Ministry of Hill Country New Villages, Infrastructure and Community Development. 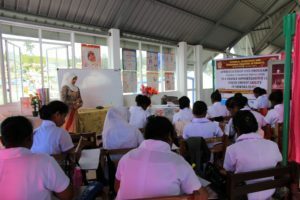 The training programmes are being conducted in several locations in Nuwara Eliya district in partnership with a number of specialised agencies including the National Apprenticeship Training Institute (NAITA), Gamini Dissanayake Institute of Technology & Vocational Studies, Ministry of Tourism Development and Sri Lanka Institute of Tourism and Hotel Management (SLITHM). Four vocational training programmes are currently being conducted with project funding benefitting 117 youth. A vocational training programme on wood craftsmanship has already been conducted for three trainees in partnership with the Vocational Training Authority (VTA). These trainees are currently undergoing on the job training. Presently, in partnership with NAITA, UN-Habitat is conducting a nursing assistant training programme and tailoring/stitching training programme. 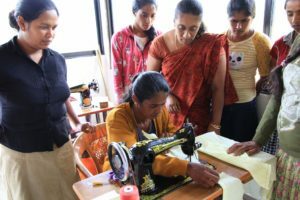 Twenty two female trainees are enrolled in the nursing assistant programme in Nuwara Eliya town centre, while 11 female trainees are enrolled in tailoring training at a community centre in Kikiliyamanna village. For IT and Basic Business English training, 67 trainees are undergoing training at the Gamini Dissanayake Institute of Technology & Vocational Studies in Nuwara Eliya. The hotel management training course consisting of housekeeping and food and beverage management, is conducted in partnership with the Sri Lanka Institute of Tourism and Hotel Management in Nuwara Eliya town with 17 trainees. The vocational training programmes are three to six months in duration, consisting of theory as well as practical, on the job training. All training programmes lead to National Vocational Qualification (NVQ) level three/four, depending on the area of training. The young men and women, hailing from diverse backgrounds in Nuwara Eliya, from villages, towns as well as estates are eager to pursue their vocational training opportunities and improve their employment options.